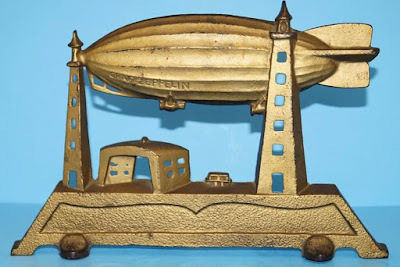 I’ve seen two different souvenir replicas of structures meant to moor or dock blimps – also called zeppelins, dirigibles, and airships. Did you know that the Empire State Building was designed to allow blimps to dock at the top and load and unload passengers? A souvenir illustrating this was made in the 1930’s and measures approximately 6 1/2" high and the airship measures approximately 6" in length. The 4 sides of the building read: "Worlds Tallest Structure, Empire State Mooring Mast, 1250 Feet High, and New York.” Perched atop the building and mooring mast is an airship, which reads on both sides "Zeppelin." In the 1930’s, the Graf Zeppelin was making regular passenger flights to the United States and it was thought that docking at this new feat of architectural engineering would be quite the marvel. In actuality, this never came to pass due to strong wind conditions especially since the passengers and crew would have disembarked on a narrow open-air walkway. 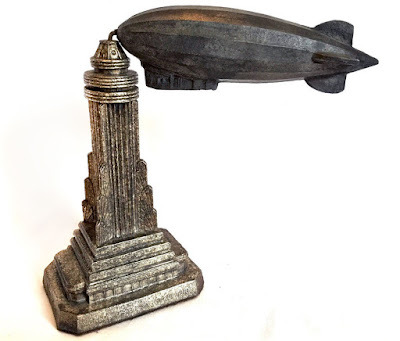 Another antique souvenir is a doorstop made of cast iron depicting a Graf Zeppelin at a Mooring tower and measures 8 3/4" tall x 13 1/8" wide. The towers were used for short term use when the airship was not in the hanger.